Thank you for tuning in to episode 97 of the podcast! My guest is Jennifer Brown, who was actually the first interview I ever had on this podcast and is now back for her third appearance! In this interview we really focused on the topics of growing a personal brand, growing a business, writing a book, publishing your thought leadership. 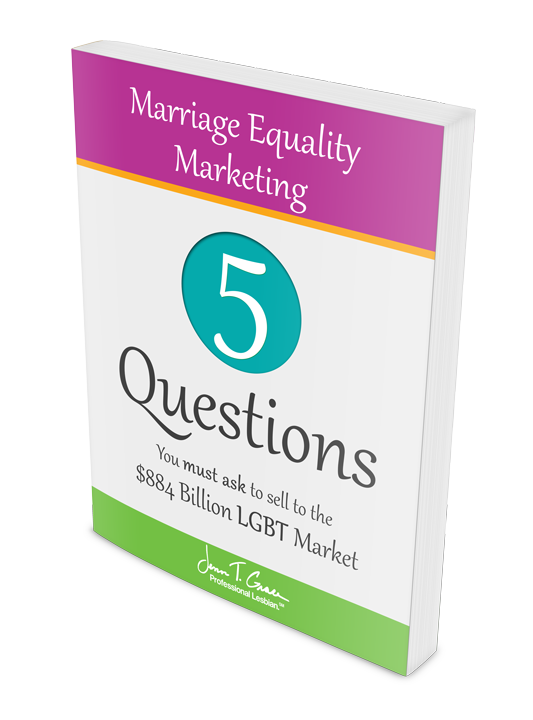 The tips Jen provided in this interview resonate across the board; whether you’re an LGBTQ professional, woman, minority etc. The principles are similar regardless of how you identify. So have a listen and let me know what you think! Jenn T Grace: You are listening to the Personal Branding for the LGBTQ Professional Podcast, episode 97. Jenn T Grace: Hello and welcome to episode number 97 of the podcast. I am your host, Jenn Grace, and today I have a really awesome interview with a very dear friend, colleague, mentor, just so many different things that we can kind of categorize her as. And it is with Jennifer Brown, and she is a third time guest on the show, so this will be the third time that we have heard from her, and every time that she’s on the show we end up talking about a variety of different things, and I truly feel like the opportunities are absolutely endless with the different directions that any one of our conversations can go. So back in 2013 she was the first interview that I ever had on this podcast, it was episode number 4, which was indeed a very long time ago since we’re in episode 97. And then I also had her on as one of the interviews for the Thirty Days, Thirty Voices project, and that was a thirty day series of LGBT leaders just doing really awesome things in the community. 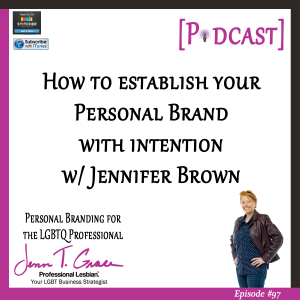 So in this third time that Jen is on the show, we really, really focused on the topic of growing a personal brand, growing a business, writing a book, publishing your thought leadership. We really just, just, just scratched the surface on so many possible directions that all of this can go. But I’m hoping for those who are listening to this, and you have found your way to this podcast because you really want to know more about personal branding. 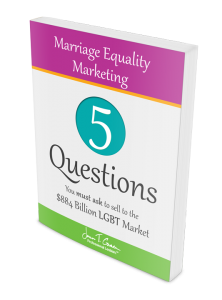 And while yes, the show is called Personal Branding for the LGBTQ Professional, these tips and advice really kind of resonate across the board whether you’re part of the LGBTQ community or not. And Jennifer being in a diversity setting and having a business on diversity and inclusion, certainly talks about women, it talks about people of color, talks about LGBTQ people, and really all of the principles are very similar regardless of how you might identify. So I’m really pleased to share this interview with you, and we do talk about Jennifer’s upcoming book and it’s called, ‘Inclusion, Diversity, the New Workplace, and the Will to Change.’ And that is available on Amazon, it’s available as of right now as you’re listening to this, however I have been helping Jen with her book for about a year now, and we are finally at the place of having it be live, and my goal is to help her become an Amazon best seller, and I have no doubt that we are going to be able to do that. But I would love if after listening to this interview, and you’re really kind of inspired by what she has to say because there is a lot of really meaty information that she talks about, if you do want to get a copy of her book I would love for you to put it on your calendar to purchase it on November 22nd. That is the day that we are trying to get everyone to buy so we can get her up in the rankings of Amazon best seller status. So I’m just really proud to have been a part of helping her with her book, and really helping kind of with this shift in personal brand, which we do talk a lot about. We talk about running a consulting business, and then also building a personal brand, and having both of those happen in tandem. There’s definitely a lot of information in this. After you listen I highly encourage you to reach out to me as always. If you would like to get in touch with Jen, she provides all of her information at the end of the show, but if you would like an introduction feel free to email me, get me on LinkedIn, Facebook, Twitter, you know how to find me. It’s at Jenn T. Grace at pretty much any of those locations. So without further ado, let’s just hop into the interview with Jen, and yeah I hope you enjoy. So I would love for you to just kind of start and give the listeners who might not know who you are just kind of a little bit of a background about yourself, about your consulting company, and then maybe a little bit about your personal brand, and then we’ll just kind of take it from there. Jennifer Brown: Perfect. Yeah, I am Jennifer Brown and I’ve had my own consultancy for about a decade called Jennifer Brown Consulting, and we service mainly large Fortune 500 companies in the diversity and inclusion space.  So whatever those companies need, and wherever they are in their journey, we maintain a team that develops strategies, delivers and designs training on various hot topics in the diversity and inclusion space like unconscious bias and inclusive leadership skills. And as well I have a new book out, and I am speaking and keynoting a lot. The book is called ‘Inclusion,’ the subtitle is ‘Diversity, the New Workplace, and the Will to Change.’ So I’m happy to be here today. Jenn T Grace: Awesome. Alright thank you. So for the loyal listeners of this podcast, this is indeed the third time that Jen has been on the show, and every time that you’re on we end up going down a different type of rabbit hole in conversation about what you’re doing in the land of LGBT-related stuff, and personal branding, and all that jazz. I feel like today it naturally would make sense to start the conversation with the book which you already led in with which is awesome, and maybe just kind of sharing what prompted you to even write a book in the first place. Because I know that JBC, your consulting company, is known for its thought leadership around white papers, but this is a book that is authored by you, not necessarily the consulting side of the business. So what was the impetus behind writing a book, and what was that experience? Jennifer Brown: Yeah, thank you for asking that, it’s such an interesting question. I think having a book was part of my strategic plan a decade ago when I sat down and created my company. It was a piece that we expected to be a part of our arsenal but it took me a long time to get around to it, and boy are they a lot of work so that totally makes sense. However I know that in order to build the platform for my own personal brand as a thought leader and as a CEO, it’s an important extension of that brand, and I know that it will open doors as books often do to a higher level of visibility, and opportunity, and really reputation building. It seems to excite people in a way that I have read about but I haven’t really seen firsthand, and now I’m seeing it. Now that we’re even speaking about the book which is not even out yet until November, the level of excitement that people have about it, and the legitimacy that it brings to everything you’ve already created, it’s more than a cherry on the top, it’s like- it sort of brings it in conversation. And for me, I want to evolve into more executive level conversations, I want to evolve through and past the corporate only conversations that I’ve been in as a consultant trying to influence that world. I really want to have more of a societal conversation, a political conversation, I want to tackle different domains so I do think that this will be a great way for somebody to get acquainted with who I am and what I care about. If they pick this book up, they’ll understand why did she build the company? What is she about? What does she care about? Why is she an expert and who is she as a person? And I think armed with that I will be able to enter new communities to be a change agent within those communities. You know when I think about the choir that I have worked with and focused on for a long time, it’s the change agent within the corporate structure, and the person that’s running diversity and inclusion, or the- it’s the LGBT, or woman, or person of color individual who’s trying to get ahead and is looking to be empowered. And I still love that community and that’s my primary community, but at the same time I need to take the message of everything I’ve learned and bring it to people that know nothing about what I’m talking about, and really make this message acceptable to them, and I think that’s the work that all of us really should be thinking about doing who identify as change agents, is really getting outside of the choir and trying to reach that mainstream world out there that really needs to hear what this is all about. Jenn T Grace: So I have two questions as it relates to what you just said. So first of all, the book title as you mentioned is ‘Inclusion: Diversity, the New Workplace, and the Will to Change.’ So if you were to summarize kind of what inclusion is for the person who might be listening to this who for the most part is likely going to be an LGBTQ entrepreneur, or maybe a business owner of some kind, what exactly are you talking about when you say ‘inclusion’ as it relates to the new workplace? Jennifer Brown: Well if we’re talking to business owners, entrepreneurs, people who are thinking about becoming an entrepreneur and also who identify as LGBTQ, the concept of it should resonate with us because- and I say ‘us’ because I am exactly that profile. Inclusion of us into the- really into the economy. You know something very basic as opportunities that we have or don’t have based on maybe who we are historically, and also how competent we are and how we appear in the marketplace, how we bid on opportunities, how we are included. And I think diversity has so much to do with how we have been included or not included historically, and also how we have thought about our own story. Because we have been outsiders to so much because of our identities. So it is the same story as for women entrepreneurs, it’s the same story as minority entrepreneurs. We are sort of outside of the insider circle that I think has started businesses and figured out how to grow those businesses and thrive. So we’re coming at the opportunity very differently, and I think it’s important to understand inclusion and exclusion dynamics for us as we build our companies, because it’s very real for a lot of us and it’s a self-talk, or a narrative, or what the stories that we tell ourselves. I mean that’s an important part of the equation and what do we see as our own limitations because of our own identity, and because maybe we’ve been on the outside, and how do we overcome that, but also build resiliency, and skills, and take risk and actually see our diversity as part of what- of the magic that we bring to the companies that we build and the markets that we’re capitalizing on, and the people that we are. So inclusion is important to understand for us because to not understand that and to deny that they’re are elements of diversity and exclusion that are happening to us as LGBT business owners is not accurate. It’s all around us, it’s in the water. But far from feeling like- or being satisfied with, ‘Well that’s something that I need to minimize, or hide, or it’s something that makes my life more difficult.’ It might have made it more difficult in the past, but the cool thing these days is that it should be actually making you more talented, and more able to pivot, and be flexible, and capitalize, and have like deep emotional intelligence, and be resilient because we as LGBTQ people have had to figure out how to do all those things in order to survive in whatever environment we have been in, professionally and personally. So when we say, “I want to start a business or I want to grow my business,” I think we ask deeper questions, we can come with an authenticity that truly draws people to us. I think we have a special tool kit, and then we have a special community certainly that is very loyal to us. So when customers and clients or however you define that, if they hail from the LGBTQ or ally community, they’re going to resonate with us in a very different and a very deep way, and I’ve seen that really play out in my own business after going to LGBTQ conferences for years and feeling like I know many LGBTQ people in Corporate America, it’s been a community that has truly believed my business up, and has been very loyal, and very invested in our success because the message that we’re bringing is so important, not just to LGBTQ people but to all talent in organizations. Jenn T Grace: You have said so much, so one of the things that I feel like might be worth going down a little bit further is kind of this dynamic of the professional self and the personal self, and I feel like you really just kind of weaved in and out of those two areas. But somebody who- maybe they’re just starting their journey on their personal brand, as it relates to the book and then maybe I guess how you’re planning on repositioning yourself as this book comes out, was it difficult in some ways to find that balance of sharing your personal story as it relates to sharing this whole kind of professional side? Because the book does kind of weave in and out of, ‘this is the landscape, this is the marketplace, here’s the workplace that we’re trying to change.’ But it’s important for so many reasons to be sharing your story, your personal story as it relates to all of this other stuff, and all of what you were just talking about. Was it difficult to kind of find that right balance of how much do you share versus how much do you hold back and vice versa? Jennifer Brown: Oh sure. Yeah it’s difficult sometimes but I actually really enjoy the challenge of weaving in my story because it’s so much a part of my credibility as a practitioner. It’s so much not just what I know how to do, but it’s who I am, and those two pieces- I think the reason we’ve had the success we have had is that our work is deeply personal at the same time as it is of professional value. So it’s interesting to run a company whose mission and vision is so personal to me. It makes it very helpful versus I’m building- I don’t know, I have to kind of work to bridge who I am and what I care about and my role as somebody who seeks change, and then this product that I’m building. But I think it always can be done regardless of what you call your product. For me it just happens to be I’m trying to create more inclusive workplaces where all kinds of people can thrive, and that was very much me as an employee before I had the company. So I remember those feelings, and I experienced that, and that energy fed the creation of the company, but it’s still something that I am fighting. Every time I walk into a room with executives I feel under fire, I feel they’re not going to listen to me, I feel that fear comes up, and I remember this is the fear that I am trying to change through having a company that is tackling that. And it feels very much like it’s closing the loop for me as a person, and for so many others, it’s improving the situation for so many others and that’s always been our goal with the company. So I think there are some things about my personal life I don’t go into in the book. So the journey of figuring out what parts of your personal story do you share, and when, and why, is I think what you’re talking about. That really interesting gray area, and as we evolve and get more confident and more autonomous I’d say, and maybe even as you evolve your personal brand separately from the company that you’ve built if you have a company, or separately from the company that you work for; as you evolve those they start to separate. And you- what I hope for myself is I have more and more freedom to experiment, to not necessarily make my personal brand always support the company brand that I’ve built per say, but that it can speak more for the questions that I’m asking myself, and others. I mean I think almost the rawness and authenticity about what I don’t know. Because I’m so busy in my company CEO role knowing what I know and making sure that I can bring people to a certain place and helping them with my knowledge and I need them to trust me implicitly. I have 150% confidence in me as somebody who is guiding a very large, typically large high stakes, high level people through this sort of process, and that’s what we do on the consulting side. But as a personal brand it’s like the metrics for success are so different. To me, what I’m learning about it is you do know a lot and your knowledge is so important, but who you are and being real about the things you are uncertain about, and the provocative questions you can ask, and the vulnerability that you need to show in order to resonate as a personal brand feels a little bit in opposition to the sort of expert stance that you have to have all the time in the circles that I run in right now. So I know Jenn, you and I have talked a lot about this dichotomy, it’s really an interesting one. So I’m just looking forward to exploring that, and noticing the tension between those two. I’m not judging it, I don’t feel badly about it, I am confident that I will figure out the right place for my personal brand to live vis a vis our corporate work, but I do think that there’s some business there that I’m interested to kind of watch how that evolves. And deep in my personal work and really think about who I am to other individuals and not just who I am to the companies that we sell business to if that makes any sense. Jenn T Grace: Absolutely. And do you think that you had a benefit from the onset that you- your company being called Jennifer Brown Consulting, obviously your name is on the company, your name is on the door, but I feel like if I go back in time and think of when we first met which is probably seven, maybe eight years ago, it was a while ago, and just looking at you as a personal brand then. Even though it wasn’t- well maybe it was and you can answer this, it didn’t appear to be overtly intentional that you were trying to brand yourself as a person. You were- when we met you were under your CEO hat of Jennifer Brown Consulting, but I wonder for people who are listening to this and they have a company but maybe it’s not so synonymous, it’s not Jennifer Brown Consulting and Jennifer Brown. It’s something a little bit different where they now are in a place where they have to bridge the gap to some degree to really start to pivot and position themselves as the brand rather than their company. Do you think that now as you’re ten, twelve, fifteen years into this, that you have kind of a benefit because you really kind of positioned yourself as a thought leader so clearly and so early on that that now is just a matter of refining what that looks like today, versus maybe when it was when you started. Or do you feel like maybe your struggles of trying to separate the personal brand versus the business still to be very much the same struggle that pretty much anybody would be going through at this point in time? Jennifer Brown: Yeah, and there are so many ways to look at this, Jenn. You know that- boy I’ve been talking about do we rename the company for years. We realized that there are sort of implications either direction you go of having your name on the door, and maybe the difficulty then of pulling your name apart from the name of your company eventually if you know that that’s what you’re going to want to do, but at the same time every time I went to think about changing the name of my company and removing my name from it, something held me back from doing that. And I’ve always sought a lot of advice about it, and I think some quarters had said to me, ‘You’re the one that everybody knows,’ and that’s a blessing and a curse but it’s actually been mostly a blessing for the company because I happen to be the kind of CEO that is out there speaking all the time, writing all the time, taking a position, I have a platform because I’m very extroverted. It’s something that suits me from a personality standpoint to always have been pretty visible, and I was an asset to the company frankly, and still continue to be probably the biggest asset to the company. Other CEO’s that are more I’d say operational or behind the scenes or tend to have a more analytical style- like say you’re a technician, you’re not the selling CEO, you’re the person behind the scenes creating the magic, doing the product design and all that, and you rely then- or you will as you grow, you’ll rely on that front facing head of sales, or that person who’s managing your marketing, or who knows, maybe you’re a CTO and you hire a CEO who’s going to be that person that’s in front of clients and customers, et cetera. Every company usually- unless your product is so magic and you don’t need sales and marketing, most companies are going to need somebody that’s facing the public. I happen to be the technician consultant that came through my education being the consultant who also enjoyed the sales and marketing side. And so it actually made sense I think the way we did it, I have to say it’s been a conversation over the many years with my team, who depending on the year, and depending on the team, I have gotten feedback about when we walk into the room we’re not Jennifer and that doesn’t feel good, and that’s been- we have talked about that and we have then kind of ended up though choosing to continue to have the full name in the name of the company. And some of those folks have rolled off because they never quite could embrace it, and that’s that natural attrition, that’s totally fine. It was not that it wasn’t painful and difficult, but that’s how you evolve to having the right team as well, and you have a team that supports you, and you have a team that actually celebrates the fact that your name is in the title and the name of the company because they’re so proud. It’s very important- we could talk about team development and selection all day long Jenn, and I know that’s not the topic here, but it was a really important evolution for me to hear that, for me to think about what is my role vis a vis my brand and the company, do we want to keep my name there or do we want to totally change to another name that has nothing to do with me. Are we ready to kind of kick those training wheels off and have the company stand on its own with a completely other name? And you know, in ten years I haven’t done that yet. I’m not ruling it out at all, and actually I think you just never know when the right moment is to actually really truly bifurcate and rename a company and remove your name from it. But that’s a strategic choice, and really to me it depends on what happens with the personal brand, and whether we feel that there’s a niche where we do that, and also whether we feel the company has built up its brand as an independent entity strongly enough that it can go on its own under another name and it’s so good, and it’s so recognized that it doesn’t really matter, it’s sort of a blip, it’s a rebranding exercise, and it doesn’t really hurt business. So you know I think that it is all kind of a question mark for me, and that’s what’s so exciting even ten years in to know that we’re still evolving, we’re still trying to figure it out. We have to see how that’s going to go, but yeah that’s my long answer to that question of what do you call your company, what’s your role in your company, are you important to your company, are you the most important thing to your company? And you know, are you a front facing person? Is that a role you like to play? And will whatever you are building in your company help your personal brand when and if you’re ready to set off on your own and take that name with you or share that name with a company for a while, and then kind of separate them a little more, how do you build that up? I mean I think to answer one part of your question, the reputation and the platform that I’ve built for myself is- I’m so grateful to have had the company to do that in. I’ve had that environment to establish myself. And I would say Jenn, that I think women, and people of color, and LGBTQ people- I don’t want to speak for everyone, for me it took me a really long time to step to the front of my own company from a confidence perspective, and that’s a long, long story and I don’t talk about that a lot in the book, and we often joke, you and I, that that’s book number two or maybe book number three. But it took me a long time and I felt that I somehow wasn’t sharing or being generous with the company by calling it my name. I struggled with my position- being as bold as I really wanted to be, and as proud as I wanted to be, and as in the front as I wanted to be, and sort of building up the confidence to step out and say, ‘I’m ready now to do a book,’ for example and put my stake in the ground. ‘I’m ready now to have a personal brand because I’m strong enough to do that.’ It took a long time to do that, to kind of learn how to lead and be proud of being a leader. Jenn T Grace: I think that there’s so much to be said about personal branding generally speaking. Personal brands have been around for- since the dawn of time, I’m sure of it. But I feel like it’s becoming so much more important in the current days and years to follow because there’s so much more about authenticity, and there’s so much more about a company or an individual wanting to do a business with another individual. So I feel like there’s all of that that’s kind of like wrapped around this on top of it, so it’s interesting because you have been in this for fifteen years or so, and you’re coming at it from a completely different vantage point than somebody who is deciding right now today that they are going to form a business and kind of figure out what strategic direction do they go in? Do they use their name or do they come up with a different company name and build the company and their personal brand at the same time? Like there’s just so many decisions that kind of have to be made, and a lot of people I think just fall into whatever that decision is without a lot of strategy behind it. Jennifer Brown: I think you need both. I mean I think you’ve got to think about both from the beginning, and you have to be really clear from the various roles and hats that you wear, vis a vis both. So like I said, I’m a selling CEO in my consulting business. I also happen to be a technician, but in the work that we do. Originally that was my training. So what my team tries to do now is- and I’m the one with the trusted relationships in our market. So everybody knows me and the trust is huge in the business that I’m in. It’s not just your technical skills, it’s do we trust her, do we trust her team? If we bring them in will they make us look good inside our company, our big corporation, et cetera. So all of that I think is that personal integrity piece that the company has earned and the team has earned but that I’m ultimately responsible for. So I have to- if I have my CEO hat on, I have to run a tight ship, I have to hire the best people, I’ve got to deliver on what we promise. I’m also out there creating thought leadership and reputation for the company. Then when you say, ‘Okay what’s your personal brand? Is it separate from that, is it the same from that?’ I would almost say again it comes back to the role that you play best. For me it just made sense given that I’m so out externally focused, I’m so in the marketplace, I so want to be in the conversation on both fronts. But I’d say if you’re not that kind of leader and those aren’t your strengths or your passions, if you love to build, if you’re sort of more of an engineer and you like- you’re introverted and you like to sit alone and craft things all day long, your brand within your company is not going to be as visible as my brand is in my company. People aren’t going to know you, maybe you don’t want them to know you, maybe you want to lead with a concept or an idea, you want to lead with your team, you want to lead with your product. I think we’ve done a little bit of all of that, it’s not like we don’t lead with the product, but I’m sort of an indelible part of the product. And so it’s interesting like the lines are so blurry for me, but I’ll tell you as you get larger, if your personal brand in your company is very visible, as you scale your business it’s harder and harder to maintain the intimacy that you have worked really hard to build, and that you really treasure and enjoy. And that’s a hard part about getting larger as a company, is that you lose the high touch opportunities. We’ve got 8,000 now in our database and I’ve collected them over ten years as you know, Jenn, and I can kind of tell you the story about every single one of those people. You know, I know where I met them, and they heard me speak, and there’s a million stories that they have about me, and I try to stay ahead of it but it’s really difficult. So I think too just the difficulty of scaling a personal brand, at least in the consulting environment, is an interesting challenge. On the personal side though, if we build a personal brand that’s really much more about the individual, whether that means I’m doing through coaching, or we’re doing sort of a different business where I’m reaching in and working with people, not just companies, maybe we generate that intimacy again but in a different way, and they know Jennifer and they can spend time with me. But as my consulting company gets larger and larger it’s more and more difficult for me to intersect and interact directly with clients and the people that I originally was influencing when I started the company ten years ago, and I was teaching every class, and I was meeting every person. So as someone who really cares about relationships and values that intimacy- and I get a lot from that intimacy. I don’t just want to be a CEO that’s somewhere disembodied. To me it has to still be organic, and I need to still be in the conversations because that actually helps me be a thought leader. If I can speak on a firsthand basis, not just reading reports from my teams that are doing the work, but if I can actually feel intuitively the conversation that’s going on amongst my constituency, it enables me then to say, ‘Okay we’re on the right track, we’re talking about the right things, we’re providing the right services that are most urgent for people.’ And for me to walk into an executive room or interview a CEO, I have a lot of credibility and depth that I pull on to make sure that I’m very connected to the conversation. So that’s kind of the danger of growing a bigger company is that you lose touch with that, and I think that’s so much a part of my brand, is the ability to really keep it real. Jenn T Grace: How do you find that balance though? Like what do you think- so for somebody listening to this who might be overwhelmed just at what you’ve been talking about, how do you find some kind of balance where you can continue to grow your company, but you can also still be involved in those conversations that will keep you on the forefront of whatever the industry is that somebody might be in? Jennifer Brown: Yeah, that’s a challenge. I hear a lot of people, what they do to kind of satisfy that, is they do a lot of pro bono work for example. They kind of bifurcate it, they’ve got their business to run but then they do community conversations, they teach for example- not that teaching is pro bono but they’re working with young people in some way, and that kind of scratches an itch for them in terms of continuing to keep their feet on the ground and really make a difference. For us at JBC, we make a difference constantly. Like every single thing we do is making this like transformational difference for people because we’re giving them confidence and skills and helping them find their voice. So everything we do has impact. So I think for those on the phone who may not be running this kind of company, I’d say just to pay attention to how will you be satisfied and feel that you’re doing your sort of heart work, because business can be exhausting and I think we can lose track of why we even started in the first place, we can get disconnected from what’s most important to us or not make time or have time to do that. But I’d say pick and choose if you have a team, and even if you don’t and you’re a solopreneur, make sure that you’re doing the kind of work at least for a portion of every day that really fulfills you, and really replenishes you. Because when you’re running a business that has to make money, I would guess most of us in the audience and myself included, there are many tasks that we do during the day that deplete us whether we’re managing conflict, or I don’t know, trying to make hard hiring decisions, or dealing with difficult customers and clients, or managing cash flow, or things that- as I think through the things that deplete me versus the things that replenish me like investing in my community. Like for me- and that’s evolving. What are the things that I really enjoy now versus a year ago? Versus four or five years ago? It’s actually really evolved and there’s not one thing I think that replenishes me from a work standpoint, there’s a couple different things that I enjoy that I wish I had more time to do. Some of them make money for our company, and some of them are things that I would prefer to do just because I want to do them. So I think our own nurturing and pacing ourselves and sustaining our energy as founders and leaders, it just is so critical to seek those things that give us energy as opposed to taking it away, because business leadership and existing in a commercial world is a very difficult balance between kind of what needs to get done and what we really want to be doing every day. And I would say to sort of pay attention to that, journal about it, notice how you spend each day, each hour of each day, notice your energy. Are you tired? Do you have a headache after a certain conversation? I mean my body tells me a lot about what kind of zone I’m in at any given moment. I know what’s hard, and I know what’s easy, and like I feel like I could do it every day all day, and all of our goals should be to kind of shift our lives more towards the latter if we can. Jenn T Grace: Do you find, or have you had conversations that people- you know I have a client of mine that calls them gremlins, where you have those gremlins that are kind of in the back of your mind, or in the pit of your stomach that are saying, ‘Who are you to say that you can work in your happy place all day? Who are you to say that you don’t have to work with difficult clients?’ Because I hear what you’re saying and I think it’s brilliant because I so feel the same way. You have to find what makes you happy, you really have to pay attention to what your body is telling you, because nine out of ten times the signs are there if you’re just quiet and still enough to listen to them. But I also know that there are so many people who get stuck in their head and they start to doubt themselves and say, ‘Well how come I can make this decision that I’m only going to work with this type of client that makes me happy?’ Because people are somehow engrained in them that they have to be miserable in their careers or in their businesses. I feel like that’s a large conversation that I kind of hear from kind of the periphery, because I’m all about working with people who are awesome, who are doing good for the world, and I don’t want to work with people who give me a headache after being on the phone with them. How do you kind of I guess balance that as well, and have you personally had those experiences where you’ve even doubted your own intention or your desire? Maybe not current day, but perhaps it was in the past. Jennifer Brown: Oh yeah, so many times. I think as I said earlier to build your confidence as a leader and to trust your instincts, for me took a long, long time. I tend to listen to others too much, and I’m not tuned into what my sense is about things. Coming to that confidence was a really, really hard one and taken me much longer than it should have, and what I chalk that up to frankly is honestly being a woman business owner and being LGBTQ to a certain extent, and the lack of role models that I have been able to see that resonate with me that are available to me so that I could have gotten there quicker. And it’s one of those things that is a shame, and it’s not right, it was a missed opportunity for me, and I was delayed because of it. I was delayed in my development as a leader. It took me much longer to get my company to where it is now than it should have. But it’s because of the messages I was getting or not getting, the mentors that popped up in my life, whether they happened to be all men, or whether they happened to be- which they were, or whether they happened to be people that didn’t have my best interest at heart but I trusted them and I shouldn’t have. You know there’s so many mistakes that were what I call unforced errors like in sports, that I made that nobody caught me doing it and redirected me, because I just didn’t have that guidance. And then to tune into yourself, and to learn to listen, to quiet it and say, ‘Am I happy? Am I working on what I want to be doing? Am I noticing stress level? Am I fulfilled and how can I reorient my life, my activities, my company accordingly?’ That takes the ability to listen to ourselves, and the confidence that the commercial market is going to appear if we do that. I think we have so much fear. ‘Well I have to keep going, and I have to keep delivering this, and I committed to doing this, and this is my brand,’ and we end up- the tail ends up kind of wagging the dog. So this dynamic is to shift the power dynamic and to take that power, and to know that when we do that and we put this powerful vision out into the world for whatever we’re building, or bringing, or whatever service we’re providing, the right clients will find us. And it feels very risky, it has always felt risky to me to do that, and I think you can’t be foolish about it and completely ignore your market and what your market is telling you. So it’s kind of an inside out, outside in dynamic. You’ve got to pay attention to both sides, but I think for me, I’ve been very reactive and I think I’m finally stepping into a proactive stance in the market, and the book is a big part of that proactive stake in the ground. It says here’s everything I’ve learned in those trenches, and I’m going to not only share it, but I’m having an opinion about it. It’s here whether you agree with it, disagree with it. I mean you know, Jenn, I’ve said to you I get hate mail and people who are challenging me, I’ve now put my sort of personal and professional vision out there, and I don’t know what the reaction is going to be to it. And that is a huge overcoming of fear. To me that was all about I am finally strong enough and I have a wonderful team and community that’s supporting me, and I can put myself out there, and what’s the worst that can happen? And that ability to do that has taken a very long time to be ready to do that for me. It’s an interesting feeling but I’m grateful that I’m finally there, even if it was delayed, even if there were a lot of detours, even if I had to learn the hard way about how to trust myself. And I’ll say that- I did this class on feminine- it was called a Lean Startup Canvas, and it was seen through the feminine lens, and the permission- permission is really the key word to lead in the way you want to lead, and I think that versus the way that maybe we see a lot of businesses being led, and grown, and what we celebrate in terms of good business behavior, I think is still a very male paradigm that we are watching, that we are emulating. And it’s enormously powerful to say, ‘I’m a woman leader, I’m an LGBTQ leader. What’s important to me, what does authenticity look like?’ Trusting that and leading with that is the transition that I’ve been kind of coming to, and that’s just going to get stronger and stronger I think. As people’s reaction to what I’ve put out hopefully is a largely very positive one. It’s an encouragement that’s going to come back that’s going to say, ‘We need more leaders like you out there who are leading in a different way, who are building companies in a different way, who are having a different conversation, who are bringing their personal brand together with their expertise, and valuing that story, and integrating those pieces. We need a lot more business owners like that.’ I think that would really change fundamentals of our society frankly. Jenn T Grace: If you could- because I know we’re already coming up on our time, if you could distill one piece of advice, just- I’m sure you have- the conversations that you and I have just on an ongoing basis about entrepreneurship, and how to make the world a better place, I feel like we could just record those and I could air them and have plenty of material. But if we were to just kind of bring that down to one thing that you could give as a piece of advice to someone listening to this that is kind of where you were ten years ago, or fifteen years ago, what might that one kind of step be, or one thing that they could do or start to think about that could really maybe shortcut or bypass some of the hurdles and heartache and headache that you may have experienced? Jennifer Brown: Yeah I think we’ve kind of already touched on it. I think it is building a new habit to celebrate your LGBTQ identity, your diversity story, and really do some work- deep and I would say even spiritual work, however you define that, on the role of that story in creating the kind of leader that you are, or that you want to be. And I mentioned some key words earlier like courage, like resiliency, like flexibility, like emotional intelligence and sensitivity to others, like inclusion. I believe- I believe that LGBTQ people, but also entrepreneurs specifically, have this very unique opportunity to change the world. Whatever we’re building, to me that’s kind of secondary. We are role modeling every day with everything that we do so that others don’t have to suffer in the way that we did. And I know that the suffering is on a personal level and a professional level, and the suffering on a professional is, ‘Gee I don’t feel that I fit in, I don’t feel comfortable playing the game. What is the game? What are the rules of the game? What are people going to think of me? Are they going to accept me?’ All of that narrative is swirling around as we’re trying to do business, as we’re trying to impress people so that they will give us their money frankly, because that’s what it is at the end of the day. But we get in our own way as much as maybe our external world is preventing us. And I would say these days what I find mostly for LGBTQ people and entrepreneurs is there’s some of us that are awakened to the huge opportunity in front of us to grab our power, to really own that story, be authentic, role model for others, be a force of change, and bring your business along that journey and it will thrive as you’re doing that, because remembering it’s as much who you are and the relationships that you’re establishing, and sort of the shared trust that you’re building, as much as it is what you are selling or marketing. And I would say do some work on integrating those pieces. Think about your personal brand, think about your company if you have one, or your product, and think about do they intersect? Are you keeping them separate? Is there sort of a one plus one equals three part of this equation that you are not exploring to the extent that you should, and that there’s some magic there that you haven’t yet even tapped into? And that would probably be- that would probably be my biggest advice for this community because it’s really proven true for me. I know that it can work, and that it’s been even unexpectedly wonderful and transformative for me both on the personal brand side and the company side, and it’s very cool to see. But I think there’s something there that could really apply for everyone in your audience, Jenn. Jenn T Grace: I love it, and I think that your book is a natural tool for a lot of people listening. While no, many people in this audience aren’t going to be DNI practitioners, but I feel like a lot of what you were talking about is in the book in terms of just bringing your authentic self to the workplace, or defining your diversity story which I know is a chapter in the book too. So for those who are listening- so the book is available in November, and this is coming out on November 10th, so we are hoping to get Jen on the Amazon best seller list, so if you are interested in purchasing the book, you can do so on November 22nd which is when we’re driving everyone to go there. But in the meantime, how would you advise people to get in touch with you? What is the best way for them? Jennifer Brown: For sure. So we’ve got our website that’s our corporate website. I think we have- we’re building and almost releasing Jenn, I think the personal brand website as well. Jenn T Grace: It should be live. Jennifer Brown: Yeah, www.JenniferBrownSpeaks.com, and that will have a lot more about the evolution of my personal brand, and my speaking, specifically highlighting a little bit more about me as a person. So there’s multiple ways you can kind of keep in touch with us. We have newsletters, we’ve got our Twitter feed which is @JenniferBrown. We’ve got our LinkedIn presence, and our Facebook presence, and if you’ve got- from this audience Jenn, I would say I’m here to support you, and what you all could do for me is if you ever encounter corporate clients, any sort of companies that are building- even fast growth smaller companies are really investing in diversity and inclusion these days. We’ve got new clients that are 200, 300, 500 people for example, and they’re trying to really build diversity into the core and the foundation of the company even though they’re not very large. That’s really an exciting conversation, and I enjoy even just mentoring and brainstorming with those kinds of founders and CEOs who are- a lot of them are straight, white men frankly, and straight women as well, saying, “I want to embed this in what I’m building, and I want to do it right, and diversity is important to me, and is important to our ability to grow and thrive.” So that’s a very exciting conversation, so I’d say if anyone on the call, on the podcast has interest in that, or has someone who needs help with that, please do reach out and we’d love to be helpful even just in an advisory capacity. Jenn T Grace: And that’s where you get your energy from, is that kind of helping that grassroots organization that we were talking about before, where the happy place is and the energy. Jennifer Brown: Yes, I enjoy that because I can relate on a business owner level, and that’s a big part of my identity in addition to LGBTQ, and woman, and all the other parts of my dimensions because owning a business is an experience like no other. It’s really unique, it’s really hard, it’s really rewarding, it shapes you, it takes over your life and heart, but we are really the creators that are putting pretty important stuff out into the world. Jenn T Grace: Well thank you so much. I feel like we could have gone in so many different directions talking today, and in just 48 minutes or so we’ve just scratched the surface of so much information. So I really hope the people do go out and get your book when it becomes available, and at least follow you on one of those platforms because you do have a lot of good information to share with the world. Jennifer Brown: I do, I do. Yeah please do, and we like to give away a lot so please go read our thought leadership, our white papers, our articles. I’m a big fan of generosity in business, and I really believe in it. So maybe that’s something that as folks are looking at how we’ve built our brand and our platforms, that level of we want to be able to be helpful first and foremost, not really sell first and foremost. We’re trying to invest in the community, so I hope that’s apparent. Jenn T Grace: Yeah, maybe we’ll have you on in 2017 and we can discuss that whole concept, because I think there’s so much to be said about that, and it will be post book launch and it will be interesting to hear kind of what happened to that too. So we’ll have to make a date for that. Jennifer Brown: Totally, thanks Jenn. Jenn T Grace: Cool, alright thank you. I so appreciate it. Jennifer Brown: Thank you, everyone. Thanks, Jenn.